The Cosy Club in Leicester opened nearly 4 years ago in a former Knitwear Factory on Highcross Street. The restaurant feels very much like it's been in the city forever. The former building on Highcross Street has been used since the 1800s. It produced all sorts of vestments including shoes, clothes, and hats. The original industrial feel of the site has been retained, giving it a real funky vibe. The Cosy Club has really made the most of the original features and it is a comfortable, airy and spacious place to dine. Leicester's Cosy Club provides some great in-house offers and events for their customers to enjoy, including their Great British Gatsby Murder Mystery Dinner Party in October. 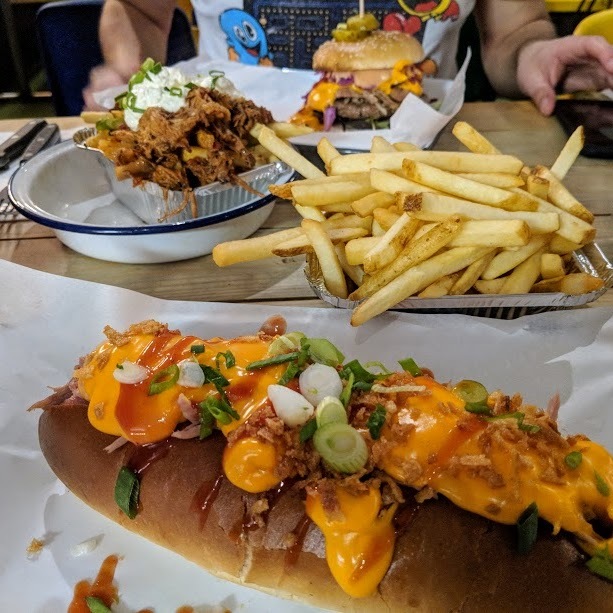 The food at The Cosy Club has a British heart focusing on luxury comfort food with some tongue in cheek classics and favourites from across the world, with plenty of punchy flavours. We were invited along to get a taste of what they have to offer. To start off I had the Tempura King Prawns. 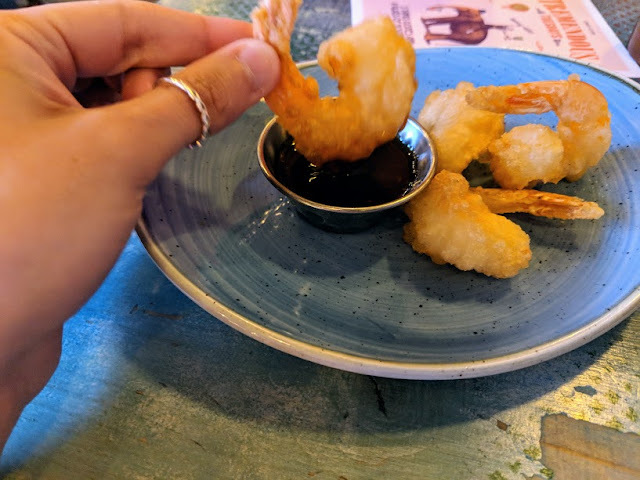 Prawns are a firm favourite food of mine at the moment so I couldn't wait to get stuck into these which came with soy and ginger dipping sauce. For me these weren't the best king prawns I had tried. I found the coating of the prawns quite raw and too soft. The prawns definitely needed the soy and ginger dipping sauce to give it anything else. 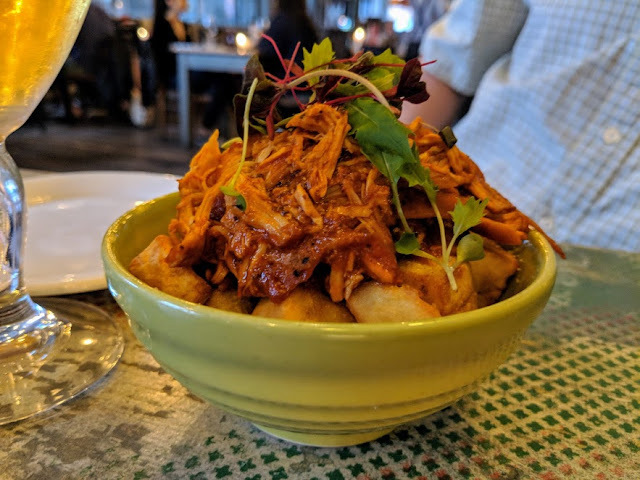 My dad's Pulled Chicken and Chorizo with crispy potatoes looked delicious though! For the main course I decided to go for the Thai Green Chicken Curry. 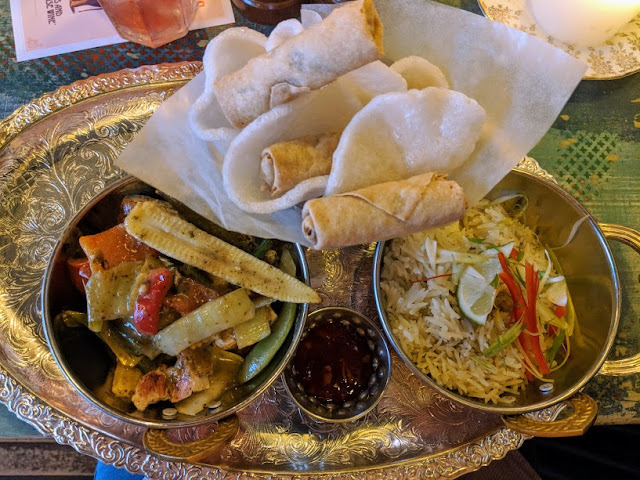 I love Thai Green curries and this one from The Cosy Club really didn't disappoint. It was a really filling dish that packed loads of flavour and enough punch that didn't overwhelm my senses. The Thai Green Chicken Curry came served with coconut and coriander rice, prawn crackers, spring rolls and sweet dipping sauce. I felt as though I could really get tucked into a variety of different flavours and the curry had a great balance of meat and vegetables to suit everyone. It really was the ideal dish for me and something I would definitely have over and over. My dad thoroughly enjoyed tucking into his Pan-Fried Seabass. It came with sugar snap peas, baby corn, red pepper, pak choi, red chilli, toasted cashews and a soy, ginger and honey dressing. The finale for the Cosy Club was most definitely their desserts, they were incredible and looked so good! I couldn't resist going for the Nutella and Vanilla Cream doughnut topped with candy floss and raspberry dust. What a delicious, naughty treat! 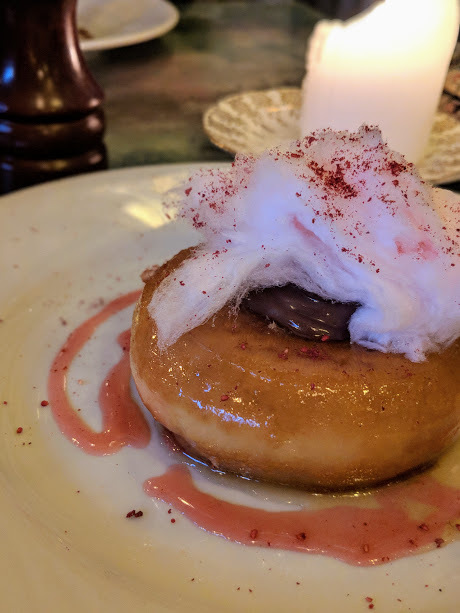 The doughnut was incredibly moist and the flavours from the Nutella and candy floss really complimented one another well. 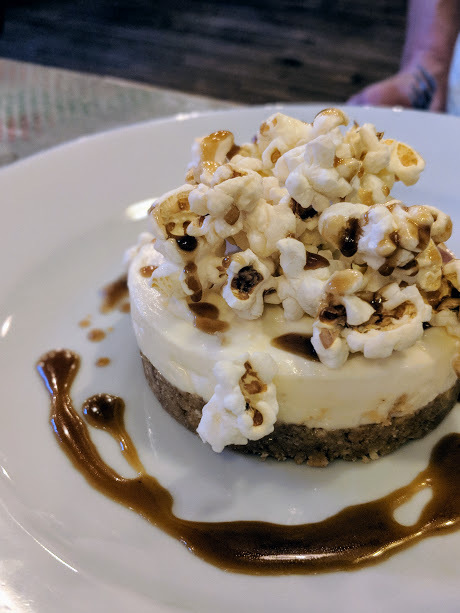 My dad got tucked into his Salted Caramel Cheesecake, topped with butterscotch sauce and popcorn! I usually get food envy, I did when I saw his cheesecake but my doughnut was something to be food envy of! 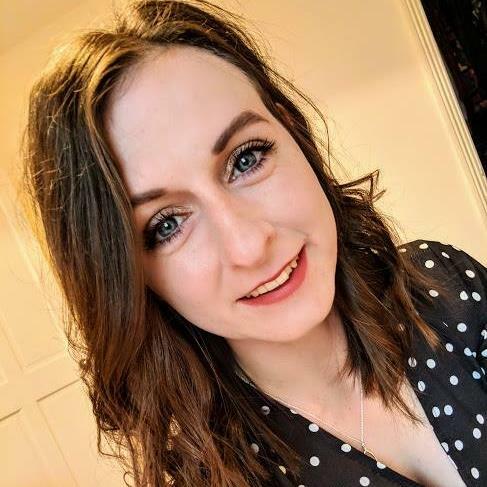 I'd definitely recommend a trip to the Cosy Club in Leicester to try out their dinner menu and tuck into the great quality food they have to offer. The restaurant also offers an extensive range of cocktails that look and read great! I can't wait for summer evenings spent at this place. Visit Cosy Club in Leicester on Highcross Street today. You can find out more about the restaurant and the menu by visiting the website. *Complimentary meal visit in return for a review on the blog. All words and photos are my own. 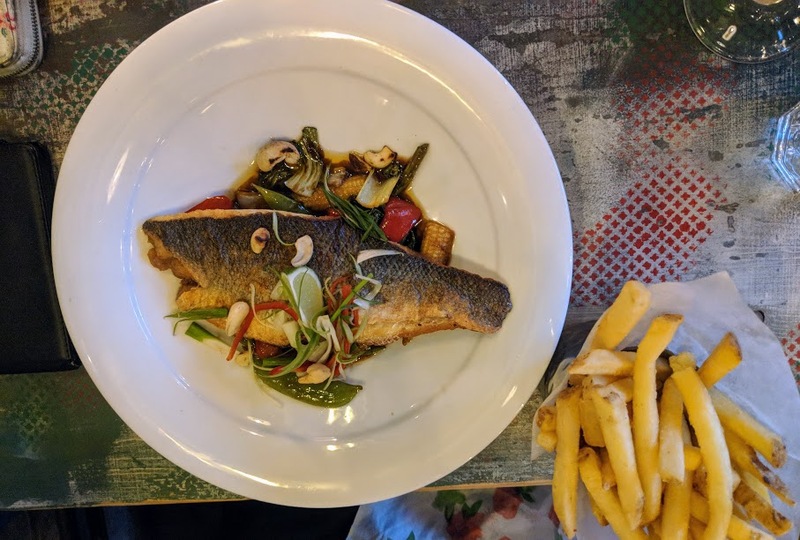 If you enjoyed reading about my visit to the Cosy Club, Leicester then you may also be interested in visiting San Carlo Restaurant in Leicester. Those desserts look AMAZING! I visited The Cosy Club a couple of months ago and really enjoyed it. that's a shame about your starter, your Dad's choice looks amazing though! 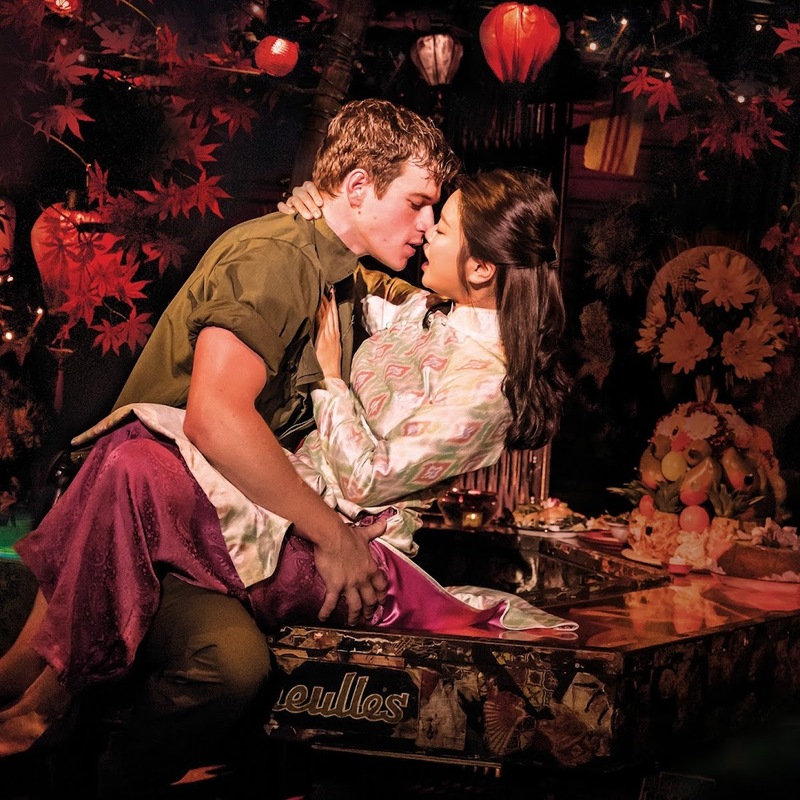 I love Thai Green Curry, I'd definitely have chosen that too! 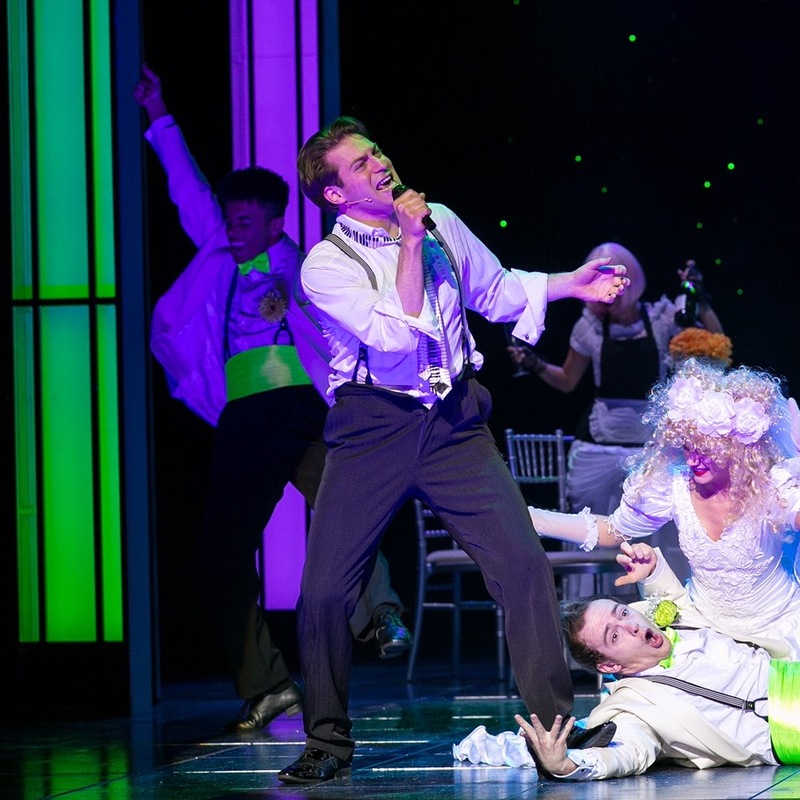 Gorgeous photos, I'm glad you had such a nice evening! Wow that Nutella and Vanilla Cream doughnut sounds amazing!!! I do love the Cosy Club although I'm not convinced that their kitchen can keep up with demand on busy days. We're still to have one experience there where we either haven't been left to wait for a long time or they've forgotten the kids' food! Last time the main courses took two hours to arrive. Still, no denying the food is very pretty and tasty!